Miki Tokushu Paper Mfg. Co., Ltd. observes the laws about the operations and the requirements agreed with customers, and establishes the quality management system to get customers' satisfaction, and act for the continuous improvement of the effectiveness. 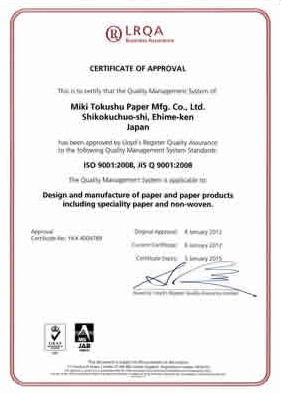 Miki Tokushu Paper Co., Ltd. recognizes that the maintenance of the global environment is one of the human common most important problems and raises all tissue and make an effort for reduction of the environment load. Miki Tokushu Paper Mgf. Co., Ltd. recognizes that the maintenance of the global environment is one of the human common most important problems and raises all tissue and make an effort for reduction of the environment load. 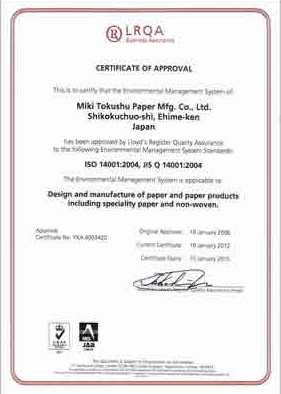 Miki Tokushu Paper promotes environment management activities based on the following policies at the harmony with global environment to reduce environment influence of all operations of the productions of functional paper, specialty paper and nonwoven and their products. 1. We arrange the environment management system, and act for the continuous improvement of the system and the prevention of environmental pollution. 2. We observe laws related to environment and other requirements that we agree. 3. We work on promotion of resource saving, the energy saving, recycling and reduction of the waste. 4. We participate in a local environmental improvement activity positively and try for the development of the product in consideration for influence on environment, production and enlargement of sale. 5. We determine environmental purposes and aims to promote environmental improvement activity and review it regularly. 6. We publicize the environmental policy through education and enlightenment activity for all employees and temporary employees. Miki Tokushu Paper Mfg. 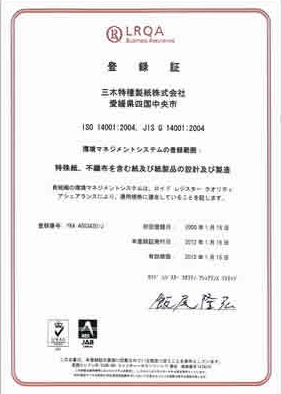 Co., Ltd. acquired Quality Management System Standard "ISO9001:2008". The details are as below. Acquired Qualification Quality Management Systems "ISO9001:2008"
Examining Authority LRQA/Lloyd's Register Quality Assurance Ltd.
We act for the continuous improvement of quality under the quality policy through "ISO9001:2008". Miki Tokushu Paper Mfg. 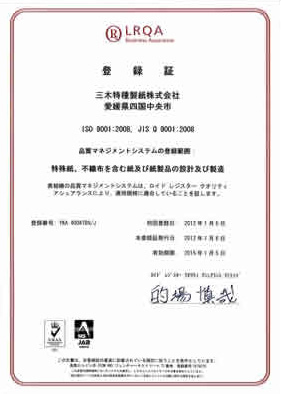 Co., Ltd. acquired Environment Management System "ISO14001:2004". The details are as below. Acquired Qualification Environment Management System "ISO14001:2004"
We act for the continuous improvement of environment under the environment policy through "ISO14001:2004".